The Linsly School is located one hour southwest of the Greater Pittsburgh International Airport and two hours east of the Columbus, Ohio airport. Take Interstate 70 West until you reach Wheeling, WV (approximately 25 miles from Washington, PA). Take Exit 2A the Oglebay Park Exit. When you exit you will see a Kroger on your right. At the 2nd light turn right. Travel 1/4 mile on National Road (you will pass a Bob Evans, and TJ’s Sports Garden) to Leatherwood Lane- this is directly across from the Marathon gas station. Turn right onto Leatherwood Lane and drive about 100 yards. You are now on Linsly’s campus. Stay to the left and go up the hill. Take Interstate 70 East until you reach Wheeling, WV (approximately 45 miles from Cambridge, Ohio). Go through the tunnels and take Exit 2A (the Oglebay Park Exit). When you exit you will want to be in the right lane. You will see Perkins Restaurant on your left. You will go straight through the light. Travel 1/4 mile on National Road (you will pass a Bob Evans, and TJ’s Sports Garden) to Leatherwood Lane - this is directly across from the Marathon gas station. Turn right onto Leatherwood Lane and drive about 100 yards. 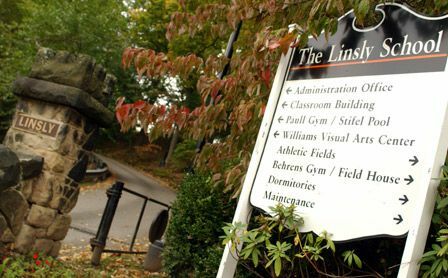 You are now on Linsly’s campus. Stay to the left and go up the hill. Take Route 7 South through Martins Ferry, Ohio. After passing through Martins Ferry you will take the first exit at Bridgeport, Ohio. You will see a sign that reads Wheeling. As you exit you want to be in the left lane. You will turn left at the traffic light and proceed over the bridge on to Wheeling Island. You will travel straight across Wheeling Island and up the Interstate Ramp. You will merge onto Interstate 70 East. Go through the tunnels and take the Exit 2A the Oglebay Park Exit. When you exit you will want to be in the right lane. You will see Perkins Restaurant on your left. You will go straight through the light. Travel 1/4 mile on National Road (you will pass a Bob Evans, and TJ’s Sports Garden) to Leatherwood Lane- this is directly across from the Mararthon gas station. Turn right onto Leatherwood Lane and drive about 100 yards. You are now on Linsly’s campus. Stay to the left and go up the hill. Take Route 7 North through Bellaire, Ohio. After passing through Bellaire you will see where Interstate 470 intersects, proceed on Route 7 North. You will get off Route 7 at the first exit at Bridgeport, Ohio. You will see a sign that reads Wheeling. At the end of the exit ramp at the traffic light you want to make a right. You will turn right at the next traffic light and proceed over the bridge on to Wheeling Island. You will travel straight across Wheeling Island and up the Interstate Ramp. You will merge onto Interstate 70 East. Go through the tunnels and take the Exit 2A the Oglebay Park Exit. When you exit you will want to be in the right lane. You will see Perkins Restaurant on your left. You will go straight through the light. Travel 1/4 mile on National Road (you will pass a Bob Evans, and TJ’s Sports Garden) to Leatherwood Lane- this is directly across from the Marathon gas station. Turn right onto Leatherwood Lane and drive about 100 yards. You are now on Linsly’s campus. Stay to the left and go up the hill.